With two cold events already this month bringing freezing conditions and snow to the UK, some are beginning to question whether there may be further cold weather this Easter. This graphic shows the greater than average occurence of westerly winds (warmer colours) during January, and the dramatic switch to greater than average easterly winds (cooler colours) from mid February. 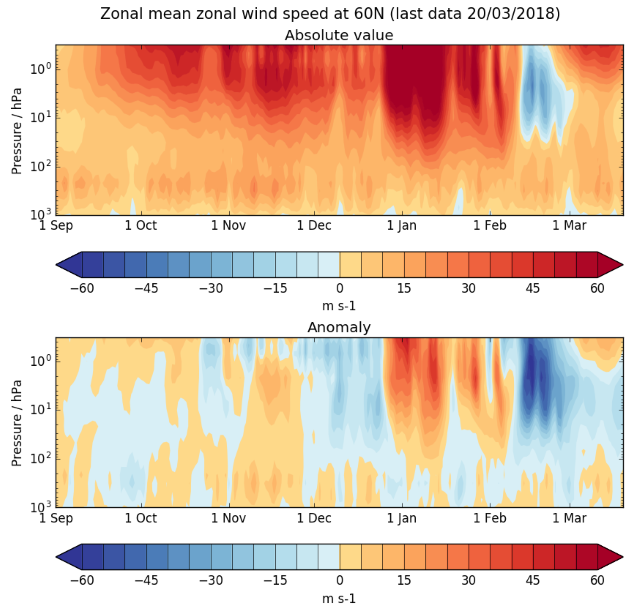 The pattern of easterly winds leading to the repeated freezing conditions, was triggered from the tropics at the beginning of February and then exacerbated by a Sudden Stratospheric Warming on 12 February. This atmospheric disturbance propagated downwards weakening westerly winds all the way into the lower atmosphere. As we have reported previously this warming had a major impact by decreasing the westerly wind speed by more than 200 km per hour. This allowed the creation of high -pressure centres developing over Scandinavia and the Russian Arctic. With the clockwise flow around areas of high pressure, this brought some very cold spells with air tracking all the way from Siberia. The black line in the above graph dips below zero in February – aligning with Sudden Stratospheric Warming. It also shows that it dipped into zero values yesterday at the extreme right. Observations now confirm there has been a second, less intense SSW event. The lower stratosphere was already disturbed and this new event is unlikely to add much extra to what was already there. 1 Response to Will cold conditions return? Hi, could you expand on your comment regarding being triggered from the tropics and then exacerbated further by thee SSW? Could I take this as tropics > extra tropics > +ve Mountain Torque> Stratosphere > troposphere > high latitude blocking > Easterly > further assisted by continued downwelling courtesy of SSW ?